Campylobacter jejuni – hugely adaptable but how does it do it? So to celebrate (that is really not the right word) World Zoonosis Day I have another post for you all – this one is looking at some very cool research into Campylobacter jejuni (hence the my earlier background posts here and here). The paper is Standing Genetic Variation in Contingency Loci Drives the Rapid Adaptation of Campylobacter jejuni to a Novel Host by JP Jerome et al (see below for full reference) and I must admit the title nearly scared me off but I perservered and I’m really glad I did. Remember how in the first of my background pieces I said that C. jejuni can infect/colonise many species? Well this title could be rewritten in layman’s terms as “Certain regions of C. jejuni’s genome help it adapt quickly to a new host”. 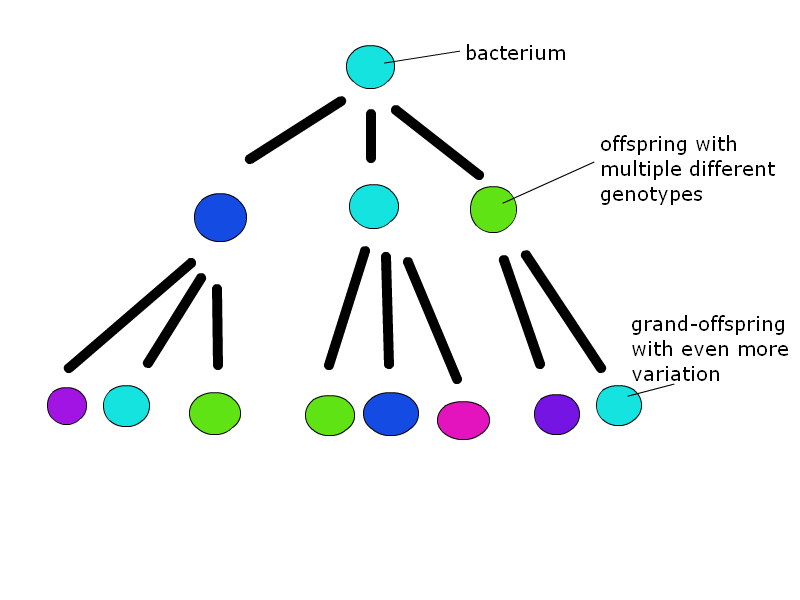 Figure 1 shows a simplified ‘clonal’ structure of a bacterial population where all of the offspring and grand-offspring (that is now a word) are identical to the original ancestor. Figure 2 is more representative of many bacterial populations (although again very simplified). 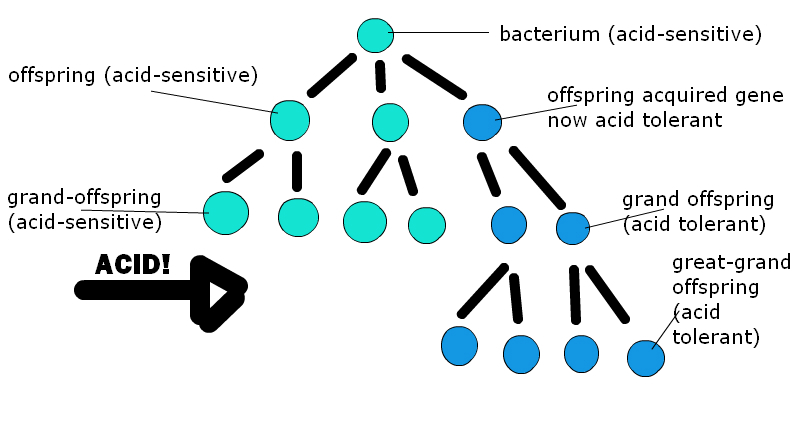 There are several ways of changing your genome if you are a bacterium (which I will probably come back to in a later post) and this change is passed on to your offspring. Some of these changes may be beneficial and some may be detrimental. Often this variation leads to selection of the group of bacteria with the ‘best’ genes for survival (or perhaps ‘best gene expression’ would be more accurate) restoring the clonal population (although there will always be the odd one that is slightly different). Figure 3 is what is thought to be happening with C. jejuni. 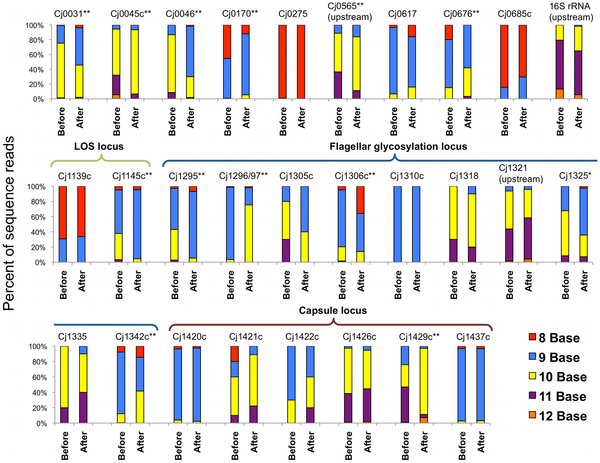 Because these contingency loci sequences frequently change during replication, a single ancestral cell can have descendants with different genome sequences In fact, with the 29 variable regions described in C. jejuni there could be 536 million different genotypes generated from one ancestral cell and so many different bugs could be present in a single population of C. jejuni. Each of these offspring can also undergo the same mispairing. Because many of these mispairings do not reduce the fitness of the bacteria there can be many different genotypes present at one time (as these researchers find, see below). So why this strategy of multiple genotypes helps C. jejuni is because (and this is going to be terribly teleological so I apologise in advance!) 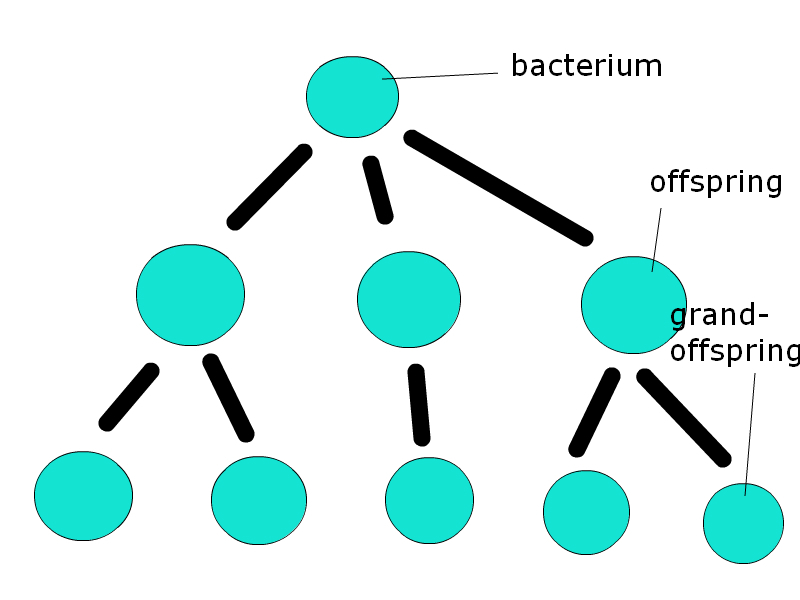 the main purpose in a bacterium’s life is to pass its DNA on to viable offspring so that it’s DNA is passed on further to its grand-offspring and great grand-offspring. If the bacterial species is one that regularly moves through different environments like C. jejuni does (e.g. it moves from the environment to chickens to man) a single bacterium is much more likely to actually have great grand-offspring and great grand-offspring in if the bacterium’s direct offspring have a variety of genotypes and therefore phenotypes (ie. some of the offspring turn out to be good at surviving in a new environment, some turn out to be bad, but at least some will survive). Microevolution of contingency loci: For each contingency gene, the percentage of sequence reads with a particular base count in the homopolymeric tract is graphed. The distribution of homopolymeric variations before (wild-type C. jejuni) and after (mouse-adapted C. jejuni) passage, for each variable gene in the genome is shown. which as well as being pretty, also backs up the assertion that “C. jejuni exists as a population of genotypes within a host” because you can see that for many of the loci there are multiple sequences present in the population. You can also see that the proportion of the population that have a specific sequence at a loci changes with passage through the mouse model. It is all very well knowing that there is a slight change in genotype but that might not mean anything as far as the bacterium is concerned so the authors then went on, first, to look at whether any of these gene changes affected Open Reading Frames (ORF) and second, to see whether there were any differences in gene expression. When proteins are made effectively what happens is the enzyme that reads the sequence from the DNA works in units of three bases (codons). The enzyme knows (teleological again – some of my lecturers at this point would be considering throwing whiteboard pens at me!) where to start transcribing because it recognises a start codon and it stops when it encounters a stop codon. The ORF is essentially the DNA sequence between the two. The addition or deletion of one nucleotide will affect the codon’s triplet make-up (e.g. if it was CAG GCT and an extra G is added upstream it may now become ACA GGC). The authors found that some of the homopolymeric tract length changes affected the ORF length (some lengthened the ORF and some changes ended up with premature stop codons) which could therefore affect protein production, meaning that these genetic differences could well be having a phenotypic effect. When they looked at the genes involved that we currently know the products of (because we still don’t know the function of some genes) some were involved in flagellar glycosylation, and some in lipooligosaccharide and capsule biosynthesis. The important thing to note is that these are surface structures and so things that the host’s immune system is likely to come in contact with and produce defenses against. If the changes in the genes allow the surface structures to change it may play a part in evasion of the host immune system. To look at differences in gene expression they looked at mRNA levels and found that there were significant expression differences between isolates taken after they had gone through the mice and the original wild type bugs. Finally they back up their assertion that these “contingency genes provide the basis for adaptive microevolution during serial passage” by reporting that there were no other genetic changes in the genome of the mouse-adapted C. jejuni with the assumption presumably being that if the contingency genes were the only ones to alter they must be the ones responsible for the increase in virulence observed with serial passage. It’s a very comprehensive paper and there are still results I’ve not really touched on in it so I’d recommend if you’re interested to go have a read of it, but what’s most important about it is that it has given researchers a better idea of what specifically to look at when they are examining how C. jejuni can adapt to so many hosts. Possibly even more importantly, it has reminded researchers that with bacteria that can change their surface structures as readily as C. jejuni seems to do, any vaccine design has to take this into account or else the vaccine could be totally useless. With Campylobacter infections costing the economy in England and Wales alone more than £500 million in one year(2), a vaccine would be very useful! Nice explanation (esp the drawings) of their study. Did you know Denmark has very low rates of Campy infection? I’ve heard it could be due to their use of nets to prevent flies (seriously). Happy World Zoonosis Day 🙂 from another zoonoses PhD student. I’ve read some work on that, although I haven’t yet seen anything conclusive about flies being the main problem (happy to be corrected if anyone knows anything). I wondered if the lower rates in Denmark are a sign of better biosecurity in general. I assumed if the farms were proactive enough to use nets to keep flies out then they were probably very hot on biosecurity in general (but I don’t know for sure as I’ve never been to a Danish chicken farm!). It will be interesting to see what further research shows.